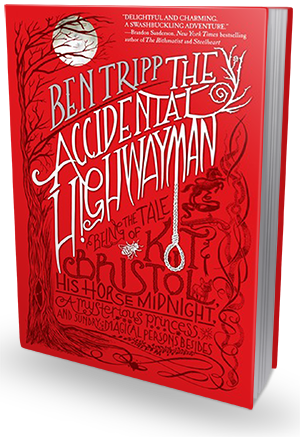 I am thrilled to be a stop on the book tour for The Accidental Highwayman: Being the Tale of Kit Bristol, His Horse Midnight, a Mysterious Princess, and Sundry Magical Persons Besides by Ben Tripp hosted by Jean Book Nerd! I have a review and guest post for your reading pleasure, but be sure to check out the tour schedule below to read additional reviews and more! Plus, don't forget to enter the giveaway! Despite my fear, I was thrilled to ride Midnight. He was a graceful animal, powerful as a bull, seeming to flow down the road like the wing of some huge raven. Again I confess childish vanity: We must have made a fine-looking pair, me in my inky-black redingote with the long skirts flying, a gold-hilted sword at my belt, and the mighty horse with his neck stretched out and his nostrils flaring, mane whirling like black flames. Something I have learned since then is if you must insult someone, it's better to shape taunts into questions that invite a rejoinder. Most aggression is relieved by speech; if you lave your antagonist with nothing to say, he shall have to find some other outlet to release his hostility. Mine found an outlet in my nose. So it was; we boarded Midnight and trotted away, and there was no further talk of separating the party that day. Princess Morgana had proved to herself how little she knew of the ways of men, and I had proved myself a fool. Some magic was done with gestures, and some with but a glance. Of the most subtle magic, there was no outward sign at all. The Accidental Highwayman is so fun! It's not a book where I'm sitting on the edge of my seating panicking over the fate of these characters, it's a book where I'm just having fun reading it. 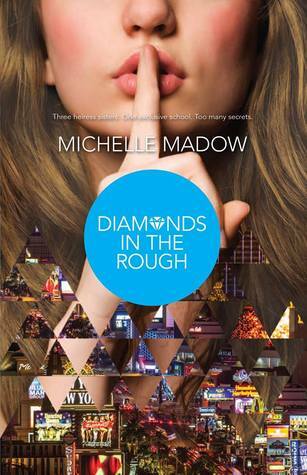 The plot is fun, the characters - major and minor - are fun. Kit is an excellent hero that you cannot help but root for. He finds himself in this situation purely by attempted to help is master/boss. He goes from an ordinary life of fetching beer and provisions to helping a fairy princess escape a political marriage she does not want. Aside from Kit, I truly enjoy the minor characters, especially Willum and Gruntle. Freed by Princess Morgana, they stay to protect her as they are the only two members of the rebel Faerie army and they adore her. They are also very true and strict when it comes to orders given to them, which causes a bit of an issue here and there (like after Kit told them he never wanted to see them again and instead of helping him when he was in trouble, they just watched), but they're rather amusing. The dialogue of some of the characters was a bit hard to get used to as they talk in an old fashioned dialect. Luckily this only applied to a few minor characters so it wasn't a huge distraction, but it did pull me out of certain scenes as I tried to figure out exactly what they were saying. The plot is interesting, but there is also a lot of info-dumping, which dragged it out a bit. I did find it enjoyable that "the editor," Ben himself, would add definitions here and there to words we as readers would be unfamiliar with. Ben introduces the novel as a story he found in a family truck that had been locked for years. This antidote adds something to the story. It makes it more than just an adventure of Kit Bristol, but an account of sorts. Despite the fantasy angle, it adds a sense of realism. The illustrations are definitely enjoyable and some of my favorite aspects to the novel. It was almost as if while writing down the story, he stopped to doodle in the margins. They enhanced my reading experience and occasionally I found myself pausing in the reading to skim pages in search of these drawing. The full pages drawings were amazing to look at and I loved taking in their details. While I did have a few issues with some of the dialogue and info dumping, I found The Accidental Highwayman an enjoyable read. The book is marketed as being in the vein of The Princess Bride and, while in my mind,nothing is comparable to the magic of Goldman, I easily saw the similarities. If you're in the mood for a story full of action, adventure, witty comments, and swashbuckling moments you definitely want to pick up The Accidental Highwayman: Being the Tale of Kit Bristol, His Horse Midnight, a Mysterious Princess, and Sundry Magical Persons Besides. The idea was to capture some of the settings and atmospheres of the novel by visiting haunted forests and sunny sheep-flecked meadows of England. In general none of this went off quite as planned. Ultimately the challenge of adventure proved too enticing and the sport of Extreme Reading was born. What makes a book more interesting? Peril.